CityMusic Cleveland celebrated the beginning of its tenth season with the debut of its new music director, Avner Dorman, on Wednesday evening, October 23 at Fairmount Presbyterian Church in Cleveland Heights. Dorman skillfully led the 40-piece chamber orchestra in nuanced and nearly flawless performances of his own Concerto Grosso, Vivaldi’s Concerto for two oboes and two clarinets, Schubert’s Symphony No. 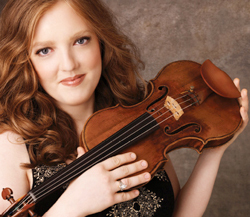 3, and the first of five different Mozart concertos with guest violinist Rachel Barton Pine. Dorman noted both in written and oral notes that he intended to show off the talents of members of the orchestra as much as possible in his first concert, and that principally meant the ensemble’s wind section, whose excellence runs both deep and wide. The Vivaldi concerto boasted pairs of soloists — oboists Rebecca Schweigert Mayhew and Daniel Rios and clarinetists Daniel Gilbert and Ellen Breakfield Glick — who matched each other’s elegant tone perfectly, yet each pair provided cheerful sonic contrasts as oboes tossed phrases off to clarinets. As always, Vivaldi was infinitely resourceful within his time-honored formulas, and he snuck in a strangely arresting rhythmic pattern at the beginning of the last Allegro. Harpsichordist Peter Bennett added stylish decorations to the keyboard accompaniment. Wind solos also distinguished the Schubert symphony that ended the program, a compact, effervescent work that has a broad smile on its face when it’s happy and only the hint of a frown when the music turns more somber. A few more violins would have improved balances with the winds — CityMusic fielded only five firsts and five seconds — but Dorman led a tidy performance that boasted perfect tempos that never sagged or lost vitality. The oboe and bassoon duet (Mayhew and John Wetherill) in the trio of the Minuet was particularly charming. Rachel Barton Pine is playing a different Mozart concerto at each of CityMusic’s concerts this week, a gesture which will be lost on listeners who only attend one performance, but which will undoubtedly keep everyone on their toes. No. 4 in D was her choice for Fairmount, a brilliant work full of fanfare-like gestures for the orchestra played by strings and winds in lieu of trumpets and drums. Pine brought energy and flair to the solo part, as well as extensive cadenzas she’s written herself. The opening movement might have been even more playful, but the final Rondo was nicely paced, with tantalizing pauses before each return of the main theme. Pine’s tone (she plays a 1742 Guarneri) is richest and fullest in the lower register, a trait that served her will in her encore, a solo arrangement of the famous Brahms Lullaby. 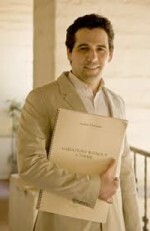 Already a composer before he took up conducting, Avner Dorman introduced himself to CityMusic Cleveland’s audiences last Spring when he narrated his engaging parable, Uzu and Muzu from Karauzu with the orchestra. He opened Wednesday evening’s program with his ten-year-old Concerto Grosso, a sendup of that old baroque format featuring a solo string quartet (Daniel Szasz, Solomon Liang, Caitlin Lynch and Keiko Ying), harpsichord and the CityMusic strings. Dorman described it beforehand as a modern concerto grosso featuring some of the sonic interruptions of life in New York — ambulance sirens, a drunk in the street in the middle of the night. The piece was an entertaining, fifteen minute deconstruction of stock baroque gestures, a sort of crazy, fragmented dream inspired by a theme by Handel and the rhythms of Vivaldi further energized by minimalism. It made us eager to hear some of Dorman’s more recent music. CityMusic repeats the program (with a different Mozart concerto each time) at First Methodist in Elyria on Thursday, Lakewood Congregational on Friday, the Shrine Church of St. Stanislaus on Saturday (all at 7:30) and St. Noel Church in Willoughby on Sunday (at 4:00).